– Once login you will be on Portal page of Azure. Note: first you need a SQL Database on Azure site with your subscription, If it not available follow the below my last blog about how to create SQL database on Azure. – The newest version of SSMS is optimized for both SQL Database and SQL Server 2016 and is also designed for use with older versions of SQL Server. To download and install the most recent version of SSMS, see Download SQL Server Management Studio. Use the following steps to connect to Azure SQL Database with SSMS. – Type “Microsoft SQL Server Management Studio” in the Windows search box, and then click the desktop app to start SSMS. How to create a Microsoft Azure Active Directory? How to create a website in Microsoft Azure from Azure Portal? Server type: The default is database engine; do not change this value. Authentication type: If you are just getting started, select SQL Authentication. If you have enabled Active Directory for your SQL Database logical server, you can select either Active Directory Password Authentication or Active Directory Integrated Authentication. Username: If you selected either SQL Authentication or Active Directory Password Authentication, enter the name of a user with access to a database on the server. Password: If you selected either SQL Authentication or Active Directory Password Authentication, enter the password for the specified user. Here we will server name, login details will be same as your subscription for first time login. – Open SSMS 2016 then enter the login details with sever db name and Click Connect. – If your client’s IP address does not have access to the SQL Database, you will be prompted to sign in to an Azure account and create a server-level firewall rule. – If you are an Azure subscription administrator and need to sign in, when the sign in page appears, provide the credentials for your subscription and sign in. 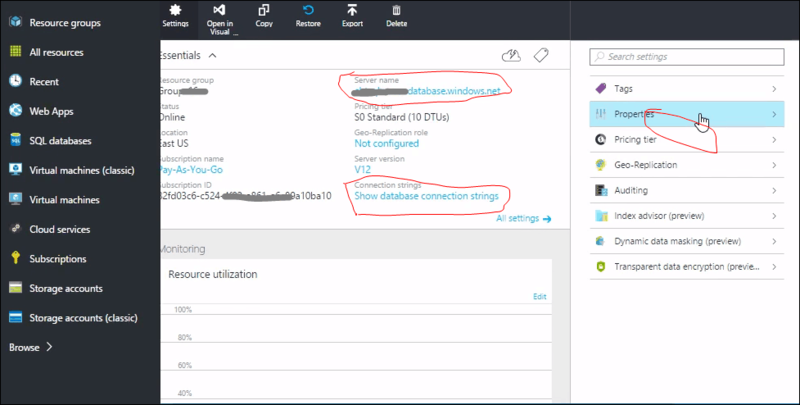 Next Article How to create SQL Database in Microsoft Windows Azure Portal?